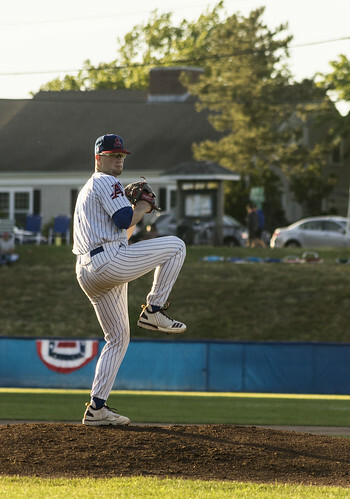 The Chatham Anglers (8-7-2) will make their first trip of the summer to Whitehouse Field to take on the Harwich Mariners (9-9-1) at 6:30 p.m. on Tuesday. Both sides are coming off losses on Sunday — Chatham to the Cotuit Kettleers and Harwich to the Hyannis Harbor Hawks — and will look to head into the Fourth of July on a high note. The A’s and Mariners faced off for the first time on Saturday, with Chatham emerging victorious behind a four-run seventh inning. Jeff Belge has registered at least five strikeouts in each of his three appearances. The score was knotted at one going into the bottom of the seventh frame. John Rave (Illinois State) and Ben Ramirez (Southern California) each drove in a run before Blake Sabol (Southern California) launched his third home run of the season to give the A’s a four-run cushion. Second-year Chatham player Dan Hammer (Pittsburgh) posted his third scoreless outing of the summer, tossing 4.2 innings and allowing two hits. Nick Scheidler (UCLA), Zach King (Vanderbilt) and Andrew Miller (Kentucky) held the Mariners to one run over the final 4.1 innings. A’s manager Tom Holliday expected a certain type of game after seeing Harwich’s averages, and he got it. “I saw the team batting average, and it wasn't really good,” Holliday said. “I figured it was going to be a low-scoring game, and I figured they're going to play their percentages." Tuesday will mark the fourth time Kyle Hurt (Southern California) and Jeff Belge (St. John’s) are paired up by Holliday. The two pitchers had their best-combined outing against the Falmouth Commodores on June 26, allowing two hits in 8.1 innings. Hurt will make his fourth appearance of the summer on Tuesday. The right-hander has surrendered six runs, three of which were earned, in 12 innings of work. Despite conceding the second-most runs of any Chatham pitcher, Hurt’s ERA sits at 2.19. Hurt’s best outing came against the Commodores. The California native allowed one hit and two baserunners in four relief innings, but two walks and an error loaded the bases in the ninth and led to two runs for Falmouth. Jeff Belge (St. John’s) will come out of the bullpen once Hurt’s day concludes. Belge has been one of Chatham’s top arms this season, ranking second on the team in strikeouts (16) and fourth in ERA (1.50). The second-year A’s player also posted his best performance against Falmouth, throwing four scoreless innings. Harwich sits at the bottom of the league several offensive categories, including runs (62), home runs (four) and strikeouts (188). The Mariners have scored three runs or fewer in 13 of 19 games this summer, surpassing five runs just three times. While its offense ranks among the league’s worst, Harwich’s pitching staff has been the best in the Cape through the first three weeks of the season. The Mariners’ staff sits atop the league in ERA (2.71) and runs allowed (59).